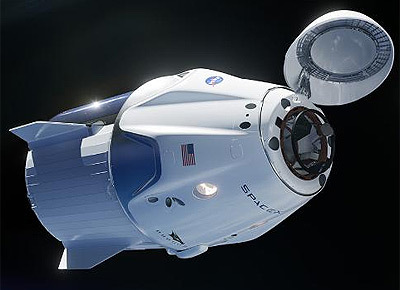 Crew Dragon is a crewed space capsule designed by SpaceX to ferry crews to the International space station. It is based on the unmanned Dragon supply capsule. seats for up to seven astronauts. an advanced launch escape system with powered abort possibilities from launch pad to orbit. A propulsive landing system for gentle ground touchdowns on legs with parachutes as back up. different trunk with fins and body and fin mounted solar cells. 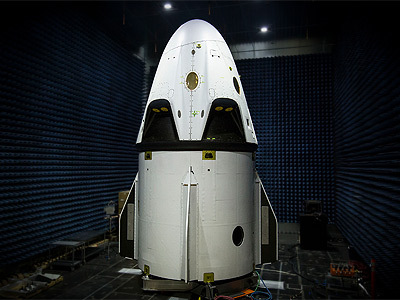 Refinements and rigorous testing of essential aspects of Dragon's design, including life-support systems and an advanced cockpit design complete with modern human interfaces. The propulsive landing system was discarded in 2017, but might be resurrected in later versions. SpaceX will demonstrate that Dragon will be able to escape a launch-pad emergency by firing integrated SuperDraco engines to carry the spacecraft safely to the ocean. SpaceX will also conduct an in-flight abort test that allows Dragon to escape at the moment of maximum aerodynamic drag, again by firing the SuperDraco thrusters to carry the spacecraft a safe distance from the rocket. 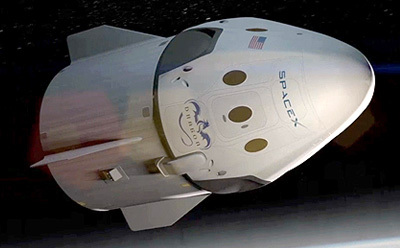 SpaceX expects to undertake its first manned flight by early 2017. In September 2014, SpaceX's Crew Dragon was selected for the commercial crew program and received a funding of $2.6 billion. The first two operational missions were ordered in November 2015 and July 2016. The first uncrewed flight demonstration mission (DM-1) was launched in March 2019 and docked successfully with the ISS. After the successful return, the capsule was to be refurbished to fly again on the suborbital abort mission test flight, but was destroyed on 21 April 2019 during a ground test of the propulsion system.